Pegasus Wealth Strategies is on a mission to help individuals work toward financial independence through planning. We are passionate about earning the trust of our clients, and invest the time needed to better understand their goals, objectives, time horizon, and risk tolerance. Understanding where our clients come from and where they hope to go, allows us to assist them in making suitable financial decisions for their future. As independent fiduciaries, our team is focused on strategies that are in the best interest of our clients, not in ours. We build long-term relationships that are based on trust, mutual respect, and honesty. We aim to be the difference maker in the financial lives of our clients, and accomplish this through education, training integrity, and outstanding customer service. 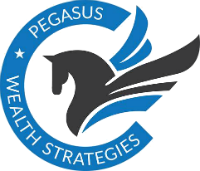 Providing sophisticated financial services with the personal touch of a small firm, Pegasus Wealth Strategies is the breath of fresh air for individuals as they plan and prepare for retirement. Rather than place our clients on the sidelines of their wealth management plan, we encourage participation, collaboration, and input throughout the entire process. When you are ready to be in control of your future financial confidence, enlist the experienced team at Pegasus Wealth Strategies. Always working in your corner and for your benefit, we look forward to assisting you on your journey toward a confident retirement.